What has four legs and is brown all over? Children’s cardboard desks and chairs brought to you by The Cardboard Guys! 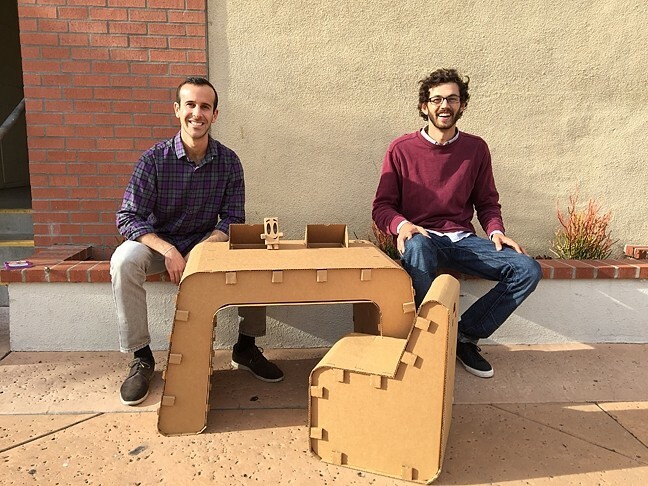 Once a Cal Poly senior project, the “kids imagination furniture” company is up and running, owned and operated by Cal Poly graduates Justin Farr and Jake Disraeli, chief financial officer and chief marketing officer, respectively. Initially, Farr, who came up with the idea, designed cardboard chairs and desks meant for Cal Poly-sized students. The students loved them because they were affordable, easy to move, and easy to recycle when the time came. It later became apparent that parents of young children were also attracted to the furniture. JUST ONE OF THE GUYS: Jake Disraeli (left) and Justin Farr (right), owners of The Cardboard Guys, sit with their company’s cardboard desk and chair with their logo and mascot, Cardboard Corey. “After my senior project, we tried to test them on people and we found they were better suited for children,” Farr said. Now The Cardboard Guys sell exclusively kid-sized desks and chairs. Farr attributes the popularity to both their affordability and the lightweight convenience of the sets, and the creative aspect that comes with it; the desk comes with art supplies and replaceable tops for artistic creations. “College kids like it, kids love it,” Disraeli said. After graduating in 2014 with an industrial technology degree, Farr moved into the HotHouse Accelerator program space in downtown San Luis Obispo to develop his prototype. Disraeli, who graduated in 2013 with a business entrepreneurship degree, was also working for the Accelerator program. After meeting Farr and his cardboard logo and mascot Cardboard Corey, Disraeli became a cardboard guy in the fall of 2014. Of all the materials, why cardboard? The idea of kids’ cardboard furniture raises several other questions, like, how can it hold any weight? Peeking at the inside of the chair, it resembles an empty wine box and doesn’t look as strong as the average chair. But looks can be deceiving. “It can hold up to 500 pounds,” Farr said, standing on the chair. As for whether a disposable, albeit recyclable, product is sustainable and a feasible product, Cardboard Guys see their furniture as a solution, not a problem. Farr said that every year, 9.8 million tons of furniture ends up in landfills in the U.S.
Farr and Disraeli hope to significantly reduce these numbers with larger public acceptance of their cardboard furniture. The pieces are made entirely in California, where they are manufactured in Los Angeles from 50 percent post-consumer recycled material. The other 50 percent of material comes from a sustainable tree farm in the Pacific Northwest. The finished product itself is 100 percent recyclable. “I think it’s more sustainable, especially for kids,” Disraeli said. Farr agreed and said that the furniture’s lifetime, generally one to three years depending on its treatment, is about the same time it takes for a child to outgrow various desk sizes. While so far there are only two cardboard guys, they said there is plenty of potential to grow. Child chairs and desks can be purchased online at thecardboardguys.com, or locally at Whiz Kids or Eco Bambino in San Luis Obispo. The San Luis Obispo Council of Governments is offering a public workshop about traffic congestion along Highway 227 between Tank Farm Road and Los Ranchos Road on Nov. 19, 6 to 8 p.m. at Los Ranchos Elementary School Library, 5785 Los Ranchos Road, SLO. For more information, call 788-2104 or email jbrubaker@slocog.org.